Heat detectors detect heat. There are two kinds of detection, fixed and rate of rise. Some detectors are a combination of both. Fixed temperature means when a set temperature is reached the device will activate alarms. The common temperatures for these are 135 and 194 degrees. 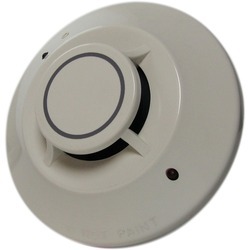 Rate of rise is a feature that is usually a change of 15 degrees in 1 minute will activate alarms. 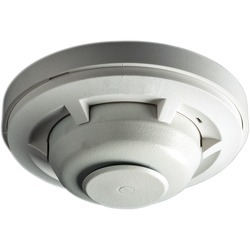 This style heat detector is not allowed in all cities due to the high rate of false alarms and inability to know which device went off because they are self resetting. Please check with your local fire dept for their requirements.